It’s a new season and there are some fabulous and fun hair color trends on the scene. The common new approach is multitoned in every tone that creates fun dimension and a sense of volume for every hair color. Try one of these on for a refreshing new start to spring. Cuivre Red: An exciting, shimmery copper shade has increased intensity and lots of shine. Autumn Red: This warm red tone provides yet another red option for that exciting color that is always in and ads spice to your day. 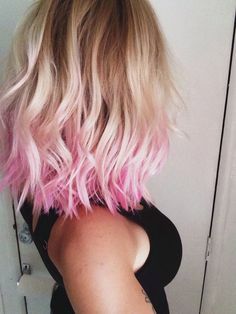 Neon Streaks: For an adventurous and edgy expression, you can go for accent neon tones throughout your hair, rather than all over neon that was popular in 2015. Compound Colors: This is an exciting new technique that involves layering two or more colors per small section or just a few strands to create a gradient tonal effect that is eye catching. Ecaille Blend: This great new take on Ombre is a very versatile approach that utilizes three or more shades and carefully applying them to create plenty movement and dimension. Pink-Copper Ecaille: What a lovely pink take on the Ecaille blend mentioned above. Bailage methods are used to create even color tones which can be very helpful when growing out colored hair. Warm blondes: Think warm sunshine, honey, and buttery tones as opposed to cool blondes. This is especially wonderful for the spring and summer season, warming things up after winter. Multi-Tonal Blonde: A great new take on blonde is creating a sensation with a mix of gorgeous blonde tones that catches the light differently from different angles. The movement and dimension in warm blonde tones will catch eyes everywhere. Spring 2016 promises to hold lots of fun and exciting options for hair color. The only difficult part is choosing which one you want to let loose with this season.